JABALPUR, MADHYA PRADESH: Speaking on the occasion of Engineers Day which was organised by Jabalpur Engineering College (JEC) and Jabalpur College Alumni Association (JECAA) on 15th Sept 2014, Shri Sudhir Kumar Mishra, OS, CC R&D and CEO & MD, BrahMos Aerospace motivated the innovative young students to contribute their knowledge towards nation building. 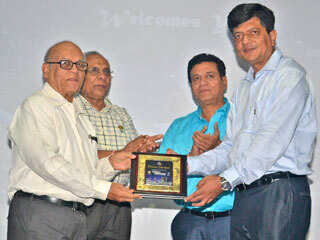 Shri Sudhir Kumar Mishra who is also an alumnus of the JEC was felicitated on the grand event. "BrahMos has set the standard to be market leader. With our endeavour to continuously progress, we are moving ahead in making India globally recognised and respected in the defence arena," Sudhir Kumar Mishra said in his speech themed on 'India - Missile Power' during the 'Distinguished Alumini Lecture Series' held at Jashan auditorium, JEC campus. Our mantra is "Strength Respects Strength" and I am assertive that BRAHMOS missile will continue to achieve greater heights, thus making brand BrahMos a synonym for "Achievement, Innovation and Success", he added. The success of BRAHMOS model is a shining example that can be emulated not only towards making India self-reliant in defence production, but also in tapping the lucrative international arms market. While interacting with the media, Sudhir Kumar Mishra said that his immediate priority is to ensure production of different versions of the BRAHMOS missile to meet the aspirations and requirements of the three services and deliver them on time. BRAHMOS Air Version would be launched by the end of this year or early next year, he added. Citing the example of BRAHMOS, he stressed on the need to develop latest technologies for achieving desired success and his dream to make reusable BRAHMOS in future. The potential BRAHMOS, developed as a fusion of great scientific minds from India and Russia, has grown from strength to strength over the years and added new capabilities to meet divergent war scenarios. Among other dignitaries, Shri Rakesh Singh, Member of Parliament, Shri Sharad Jain, State Minister, Health & Medical Education, Govt of Madhya Pradesh and Shri Ashok Rohani, MLA, Cantt. Jabalpur, were also present.